The Who has announced a huge Moving On! 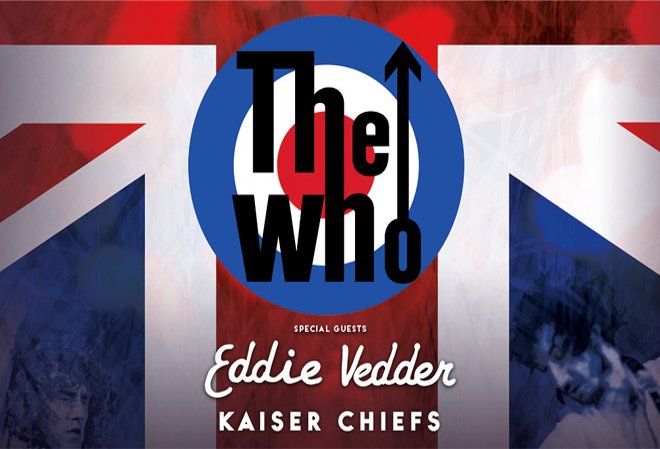 show at Wembley Stadium, London on 06 July 2019 with Pearl Jam’s Eddie Vedder as a special guest plus Kaiser Chiefs and more still to be announced! Singer Roger Daltrey along with guitarist and songwriter Pete Townshend will unleash the explosive musical force that is The Who, with symphonic accompaniment this summer at London’s Wembley Stadium. On stage the line-up will be rounded out by familiar Who players including guitarist and backup singer Simon Townshend, keyboardist Loren Gold, bassist Jon Button and drummer Zak Starkey. The iconic band have also confirmed that they will be releasing their first album of new songs in thirteen years in 2019! Since they first emerged in the mid-1960s with their distinct rock n’ roll sound, the legendary foursome has performed all over the world at global music events as well as charity concerts. In 2012 Daltrey and Townshend launched Teen Cancer America, which is now an established charity in the US. The Who frontman has also been the driving force behind Teenage Cancer Trust’s Royal Albert Hall concerts since they first began in 2000 and is also an honorary patron for the charity. Don’t miss the chance to see the one of the top three greatest rock legacies in music history performing live on stage this year! The Who made their big debut in 1964 with a trio of anthems ‘I Can’t Explain’, ‘The Kids Are Alright’ and ‘My Generation’. They have sold more than 100 million records worldwide. They have achieved 27 top-forty singles in the US and UK as well as had 17 Top 10 albums. The band was inducted into the Rock n’ Roll Hall Of Fame in 1990. In 2008 they became the first rock band ever to be awarded the prestigious Kennedy Center Honors.